Two large and massive pendulums are connected one above the other. 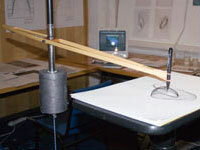 The motion of the upper pendulum is recorded by a pen attached to a counterbalanced arm. By itself, each pendulum would swing harmonically—like a musical tone slowed down. The two pendulums working together are like a musical chord—they can produce harmony or discord. One period of swing is set to be very nearly the octave of the other but they are not quite in perfect harmony. It seems that a little deviation from mathematical ‘perfection’ produces more interesting drawings. 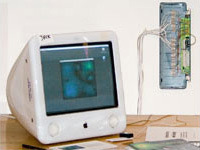 The web site has some scans of the drawings and photos of the machine installed at the London College of Communications. Eight pressure mats are placed on the floor around the room and connected via a ‘hacked’ keyboard to a java program running on a computer. The mats are mapped onto points on the computer screen and each point represents a source of waves of colour. It’s as if people standing on the mats are producing ripples of colour which interact with each other and reflect from the edges of the screen. You can try a web version of the program in which you interact by clicking the mouse rather than standing on mats. The web version requires a modern browser that supports html5 graphics.